marvin8 wrote: The main point windwalker was arguing and what Ken Gullette was emphasizing is listen to and use the clincher's downward force to escape the clinch. Other discussions may not be as relevant. They are different. It's in the elbows. Czq's opponent has pinched them in in an effort to "clinch". Kens mate leaves them slightly open. Almost loose. Rightly so for kens guy. This clinch done right should feel like the jaw is being crushed or the blood is being cut off. Done really right and strong taller guy would be jerking them around by the neck alone. I have my doubts kens neck would fair well in that outcome. A younger czq won't enjoy it but he seems to have more muscle in the region and youth on his side. Because they are different. Different body mechanics, different results. A thai clinch, a clueless neck grab committing yourself (Gullette's video) , and a "taiji hold" (nice one from Dmitri), use different mechanics. his gym so that the people he trains can gain some first hand experience with them. Last edited by windwalker on Mon Sep 17, 2018 11:34 pm, edited 2 times in total. Thanks for a simple, clear explanation. That's all I was asking for. windwalker wrote: I would suggest go back and look at the video the clinch being demoed is not the same clinch that was applied to the chen teacher. In the clip with the chen teacher the one using the clinch was not applying a downward Force that he could borrow or slip out of. Also, Ken's timing is to wait for the attacker to knee you, block and pull your head down while the opponent's leg is moving down, in the same direction. While pulling the knee back, the attacker may tend to open his arms a bit or relax to help keep his balance. Just trying to observe Ken's method objectively, before making any opinions. Ken's method would probably not be my first choice, as one could be injured from the first knee. There seems to be safer alternatives, even using tai chi moves. Last edited by marvin8 on Tue Sep 18, 2018 12:39 am, edited 1 time in total. marvin8 wrote: Thanks for a simple, clear explanation. That's all I was asking for. "look at the alignment of each forearms. look at the body line for each..
With the chen teacher the force is being directed towards his center by a slight twisting. Even if the demo person does not note it"
a slightly different wording noting the same things. Kens escape violates a couple of principles shown in the other clips by those using it in the ring. Last edited by windwalker on Tue Sep 18, 2018 12:50 am, edited 2 times in total. I don't know about dueling and challenge fights, but there is a well known story about Chen Fake killing someone in the Red Spear Society. The Red Spear Society was active during the Warlord period (1920s). "The “Red Spear Club” was an evil religious sect. Its members would utter spells and use magic charms, and by inscribing talismans on their bodies before any battle they believed they would become bullet-proof and impervious to knife thrusts. They would thus charge bare-chested into battle. When their gang had encircled Wen-xien, all but one of the citadel gates had been closed, and the drawbridge was lifted. Chen Fa-ke was standing on the bridge holding a bailagan pole (an extremely resilient tree branches for making spears). Holding the pole without a spearhead he awaited the gang’s attack. One of the “Red Spear Club” leaders rushed in with a spear and stabbed at Chen who instantly repulsed it with his wooden pole. The enemy’s spear was sent flying out of his hands into the air. Chen’s pole immediately followed through and shot forward, piercing the enemy’s torso. Seeing their leader killed, the other gang members fled in a panic. Thus was the town saved. In 1956 Hong traveled from Jinan to Beijing to study further with Chen. He arrived to find two agents from the new local government questioning Chen about the incident mentioned above, which they treated it as a ‘man-slaughter case’. After he fare-welled the two government agents Chen told Hong that a good deed done for the people had become a troublesome matter. Fortunately, the new government did not bother Chen again, because the “Red Spear Club” was a reactionary group soon to be eradicated by the new government." Post och inrikes tidningar Thanks for that Chen Fake link. All these kind of stories sound fascinating and great, and they are. Here we have the master standing up against the big bad bullies and that is fascinating and great not many people have courage to do so. But the bullies as highly trained martial artists? this could be doubted, for example punching against someone sitting down I doubt a highly trained self confident martial artist would adhere to, more the way of an bully.....Then we have groups with names as “Red Spear Society”, “Big Sword Society”. By their names one might think of groups of highly trained martial artists, even professionally soldiers. Maybe one or two at leader level where but the “storm troupers”probably ordinary peasants who’s only hope where in magic and luck with the spear or sword......For other references about highly doubting the martial quality of the challengers in these stories of the past, if I’m not misremembering masters such as Zhao Daoxin has written some about it. And also partitioners stories about how many if not most contestants at the Nanjing tournaments had no clue how to hand to hand fight. The clinch can be a very dynamic position, dealing with it requires alot of feel. There's alot of variation too... are the elbows tight? hands held high on the head, or on the neck. But, the key points to focus on are... making sure you don't get pulled down so you are leaning forward, and making sure to control the elbows in some way. Anderson Silva Clinch and elbow breakdown. Murphy's Second Corollary: It is impossible to make anything foolproof because fools are so ingenious. Howe's Law: Everyone has a scheme that will not work. I was shown a very tai chi style escape by Nick Osipzcak that I think worked well enough - nothing is fullproof really.. It combined 'posturing up' (correct posture - getting the hips in) retreating footwork and fast as possible rotations of the torso to hit the grips/neck ties repeatedly with both the shoulders. So a kind of Kao methodology really. Also to follow up this body movement can be morphed into striking method with fists in a hooking style at an opportune time. Last edited by cloudz on Tue Sep 25, 2018 2:56 am, edited 2 times in total. The Anderson Silva fight I remember the most is the one where he won the UFC title for the first time - he obliterated his opponent using the MT clinch. I think it was against Rich Franklin. At 6:02, it appears Silva does a superman punch moving backwards with right foot off the ground. I guess the speed of the punch plus Griffin's forward momentum caused the knockout. Oh, yeah. 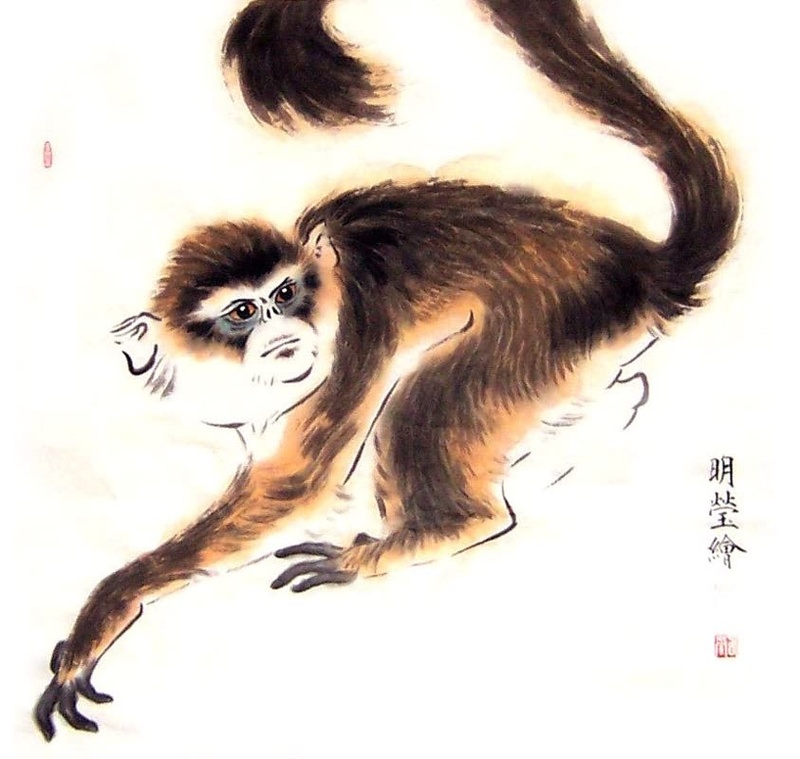 Repulse monkey. So much for "tai chi doesn’t work in a real fight." Silva uses tai chi strategy but at a distance while being calm and relaxed. I think it's mostly because he's in a full-on attack mode, and unaware of the punch. I.e. it's not because of increased speed of the punch from his moving forward -- Griffin was one of the toughest fighters at the time IIRC, and have taken much worse punishment and still kept fighting. It's because he's in the middle of his own attack and it's hard to "listen" when you're "shouting", or in tai chi terms, he's "so much yang (attacking) that it gives birth to yin (makes him/his defense weak)". As a result, he is completely unaware of that punch coming in, and that's what does it. The body is unprepared, so the brain goes "oops, something bad just happened to the head, dunno what's going on, but I better shut things down..."
If you watch some boxing/MMA matches where someone gets knocked out from a "light tap", you'll see that pattern very often, almost always IME. Last edited by Dmitri on Wed Sep 26, 2018 4:49 am, edited 1 time in total.